Marisa Seiler of Wauseon, center, heads to the basket through a pair of Evergreen defenders Thursday in NWOAL girls basketball. The Indians nipped the Vikings 32-28. Wauseon’s Sydney Zirkle looks for a teammate to pass to Thursday versus Evergreen. Pretty? Not always. Gritty? Yeah, it was that. 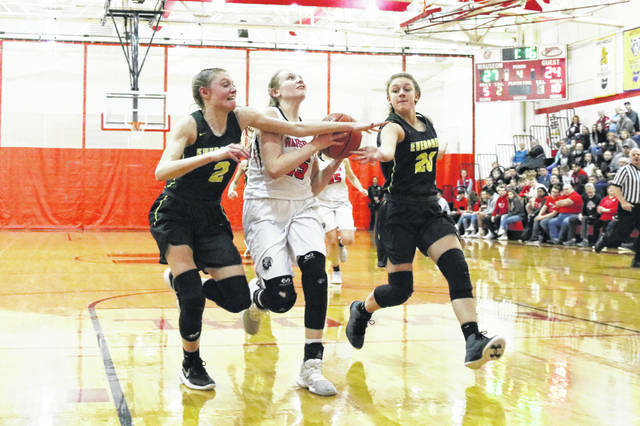 Taking the lead late in the first quarter after a couple of ties, Wauseon led the rest of way in defeating Evergreen 32-28 in Northwest Ohio Athletic League girls basketball Thursday night. It was a game where both offenses had trouble getting into a flow. The Indians ended the opening period on scores from Mercedes Osley and Sam Aeschliman to take a 15-9 lead. Evergreen opened the second period by getting a bucket from Mady Peluso, which would be the only field goal the Vikings scored in the second period. That would be more of Wauseon’s doing. Leading 17-12, the Indians were in no hurry with Evergreen defending the top Wauseon scorers. The Indians sat on the final 3:35 of the half, waiting until the clock ran to 10 seconds before running an offense. It all went for naught as the Tribe committed a turnover with 6.3 seconds left in the half. The Vikings were finally able to put something together in the third stanza. Their first field goal attempt of the quarter, after three turnovers, led to a baseline jumper from Kennedi Keifer. Naomi Brand followed with a bucket to cut the Wauseon lead to 19-17. Evergreen had another chance after the Indians missed five consecutive free throws early in the final period. Keifer converted off a turnover, then Peluso flipped in a circus shot in the lane that again had Evergreen within a pair at 23-21 with 3:16 left. Marisa Seiler answered with a drive to the hoop, plus the Tribe fixed its problems from the charity stripe. Wauseon closed by going 7 of 8 at the line. Evergreen added a late bucket to make the final 32-28. Aeschliman led everybody with 11 points in the win. Seiler added 10. Peluso led Evergreen with 9 points. Both teams struggled shooting the basketball. Wauseon finished 9 of 31 and Evergreen hit 12 of 37 shots. The Indians also finished 13 of 23 from the free throw line. “I thought we did really well defensively,” stated Cymbolin. The Vikings were at home on Saturday where they picked up a 53-49 non-league victory over Fayette. Savannah VanOstrand paced the Vikings with 13 points. 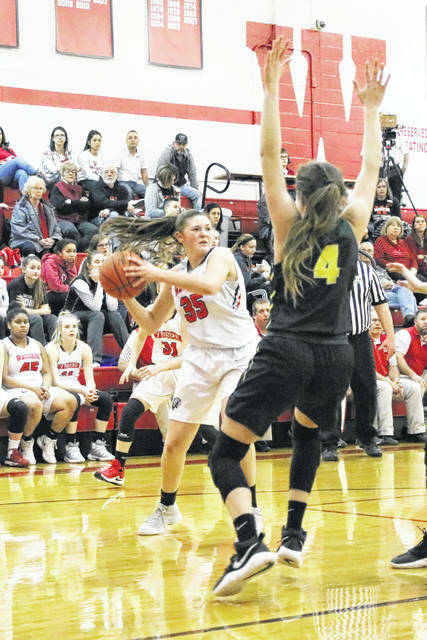 Wauseon (9-11, 3-3 NWOAL) has won five in a row and will close the season by playing Rossford at Northwood Tuesday and at Patrick Henry Thursday. Evergreen, who dropped to 3-2 in the league following the loss to the Indians, is at Patrick Henry Tuesday, hosts Archbold Thursday before traveling to Ottawa Hills on Saturday.